So, you've decided to enter the costume ring this Halloween? Well, this should be interesting. You've got options when it comes to your boxer look. Are you going to be the patriot? Rocketing into the ring accompanied by the national anthem and shiny shorts that are designed after the flag? Or maybe you're simply aiming to highlight your role as a monarch in a red and gold robe. Whatever you decide, you know you're going to have to stay tough. One thing is for sure when you start your boxer costume off with these slick, red gloves you're sure to make a heavyweight entrance at any costume party! This pair of bright red gloves has a semi-gloss pleather finish that'll add a punch of color to your costume. 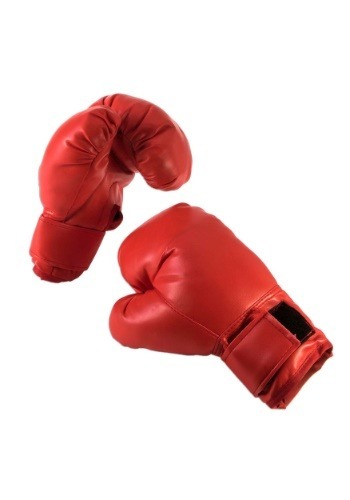 While they are padded, they are not designed to be used in any fights or boxing training. They will stay put throughout the night with hook and eye touch strips keeping them securely around your wrists. If you want to go all in with this outfit recruit a friend to be your coach and talk you up throughout the evening. After all, someone's going to have to hold your drink for you! Whether you're six months out from Halloween or it's only a week away, these boxer gloves are sure to be the fun accessory that will make you prize-fighting look complete. We're not saying you should retire completely from looking through this website, after all, you still have to find the rest of your heavyweight ensemble. But the search for gloves is over so step out of the ring and raise your hands in the air. Victory is yours!